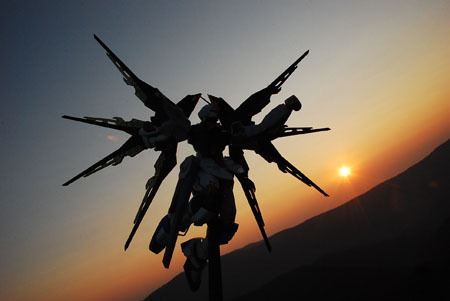 MG Strike Freedom on top of Bearface Mountain during sunrise. One good thing about being team captain on a hiking trip is dictating how much time we spend on one spot. Usually breaks are between 10 and 15 minutes. But this morning I decided to lapse a bit and took 40 minutes to an hour spot breaks. It’s not like the team didn’t like it, because there were some gorgeous views along the mountain ridge and gave me an excuse to bust out my new acquisition along with it being my first painted model of any sort. It got pretty windy up there and I was just glad to have some extra hands available…this is my last time being captain right guys? Anyways to the model…. After building the Aile Striker I wanted to go to the next step in model building and start painting my models. Originally I wanted to get the PG Strike Rouge and custom paint it, but then I saw pictures of the MG Strike Freedom, like the one Yasser Anas found, and decided then and there that was my next Gundam. I’m really pleased on how the painting came out. I used Tamiya Spray Paint cans and Top Coat and the Freedom looks so much better with both. The only thing that annoyed me was the wait on the Top Coat after spraying it on, it took about 3 days to finally cure but it was worth the wait. MG Freedom with Sabers. Both sabers can be connected together. Freedom at Waterfall w/inverted scythe blades. Freedom facing the sun. The Freedom is a pretty sturdy model when put together in fact the joints are the tightest I’ve seen so far which is a good thing when you want to pose it on a wobbly table or a mountain rock:) The wings can be a little tricky and tend to be the biggest problem for me. To extend them to their fullest you have to hold both wings together and slowly and carefully pull them apart, if you don’t the mechanism that controls the wings slips and have to be readjusted. Having said that I think the wings are one of the most attractive parts of the Freedom, especially the gold plating. This pic originally had my thumb in it and I went ahead and airbrushed it out as well as a part of the stand. Alternate position going away from the sun. Going all out w/Rail guns and Beam rifles. Freedom targeting & Gold Joints. Dragoons deployed with Beam rifles connected. For my first painted Gundam, I am satisfied and regret not painting and putting top coat on my previous Gundams. 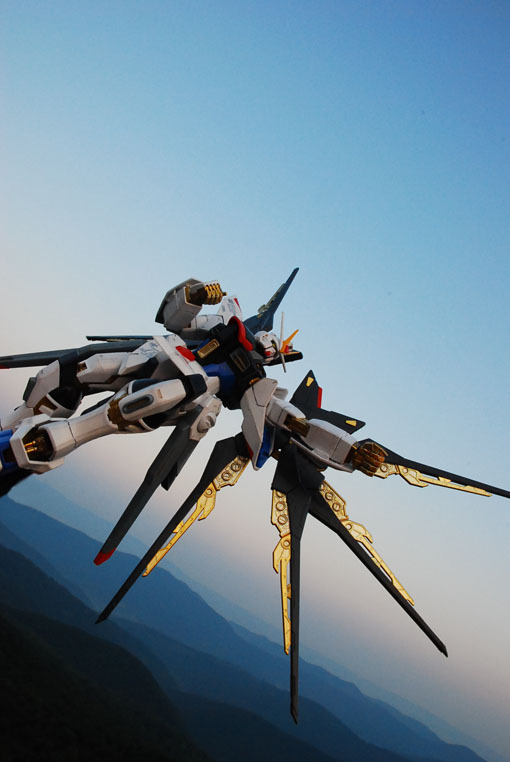 But I’m glad that the first one to go through the finishes is the Strike Freedom. It’s a wonderful designed mecha with some great maneuverability. After I received the MG Strike Freedom I received another one from a new friend, and rather than send it back and be rude about it I decided to make my first mod. It briefly appears in the video above at the end, but it’s still drying out and I didn’t have a chance to take it out with me this morning. Wings of The Enforcer pic from the Video above. This entry was posted in Gundam Model Reviews. Bookmark the permalink. Looks fantastic! All of my models start out ambitious but end up half-assed due to lack of materials.. It’s always inspiring to see others do the job right. They are gorgeous. The sunrise photos just rock. May I ask which colors you got? For red I bought Italian Red TS08 and for blue just plain Blue TS15. Those are for my Strike. I hope they turn out well. Terrific job with the Freedom! I need to take mine out of the box and actually put it together. I wish there were some mountains nearby I could go to for some pictures. 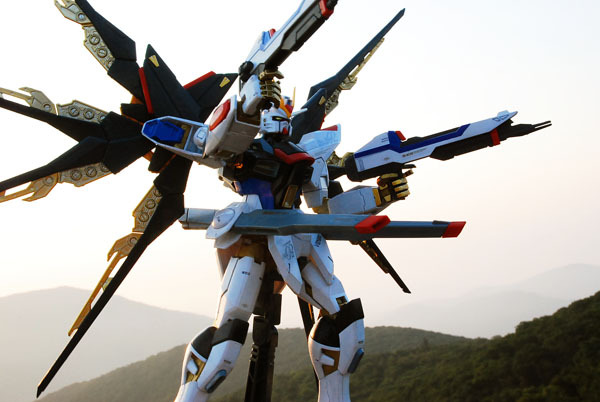 Just fabulous, your Strike Freedom. Can see all the detail you pour into It. Awesome photos, as usual ^^. Really like the pic where Its using the extended beam rifle (cannon?) and Dragoon. Waiting for the Freedom Enforcer. lol! I don’t think anybody was complaining at those breaks during that 5 mile trek on that steep range. Thank you for inviting me, we’ve got to do it again. Added another pic of the Freedom after taking my fingers off it, and a static shot of The Enforcer. @Kintaro=Thank you! Patience was the key for me on this one. I’ll be looking forward to your Crossbone Gundam, may be my next purchase. Very different from my tastes, but interesting nonetheless. @Phamalous=I saw the PG Wing Zero with Pearl Finish at Otakon, and it was tempting, I like most of the Gundams from Wing. Hope your Zaku’s coming out good. For the colors: TS-44 Brilliant Blue, TS-49 Bright Red, TS-48 Gunmetal Grey, and Matt White. @The Regault Brothers=That’s one thing that’s nice about living here! However I may be moving soon. @Lanie-emon=Thanks! It was a lot of work, I’m so used to building the Gundam in one day and that’s it. But from now on painting, inking, and putting Top Coat is a must. @Allison=I forgot to mention you in the post. Glad you enjoyed it! I wanted to bring another Gundam w/me but you saw my pack. I’ll send the pics later. Fantastic pictures Otaku Surf! You’ve got some nice angles on the mountain top. 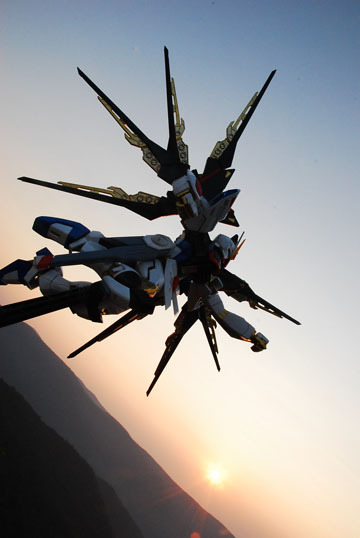 The Strike Freedom is one of my favorites from Gundam Seed Destiny. One of Kunio Okawara’s finest in my opinion. I gotta agree with everyone about the mountain pics, they’re awesome! I’m getting my first Master Grade soon, the EZ-8, and I hope to post them soon after I find a good location somewhere near a stream or forest. Hello! First time at your site and liking what I see.Your pics of the freedom are cool! I saw the video at Youtube and I have a few questions about it. 1)Did you create the banner at the beginning of the video? 2)What software do you use to make it? 3)The gundam at the very end of the video, is that an official release or something you did on your own? I collect MS in Action Gundams and I want to actually make my first model, is there a model you would suggest? Nice pictures as always! I find it interesting that you used Tamiya spray paint. I’ve been avoiding major painting due to not having an airbrush. I may have to give this a try. I tried Testors spray paint, and that was terrible. But I like Tamiya stuff so far, so I’ll have to find a kit I’m brave enough to paint now! I bought the regular Strike Freedom without the gold plating parts, but I painted and inked mine. But looking at your pics it looks like the limited edition is worth it for the plating. I’m assuming you didn’t add anything to the plates. The pic of the Freedom facing and flying towards is my favorite out of the lot. Your Freedom looks wonderful, Surf! I think Bandai should make a PG out of this one, don’t you? 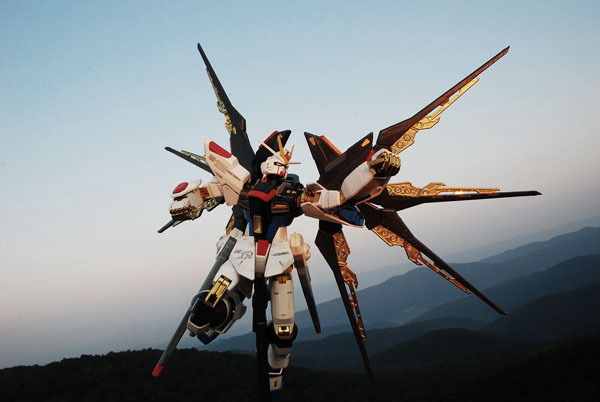 Yeah I’ve always love strike freedom the best gundam ever! Wow its a really nice spot that you chose for your photoshoot. 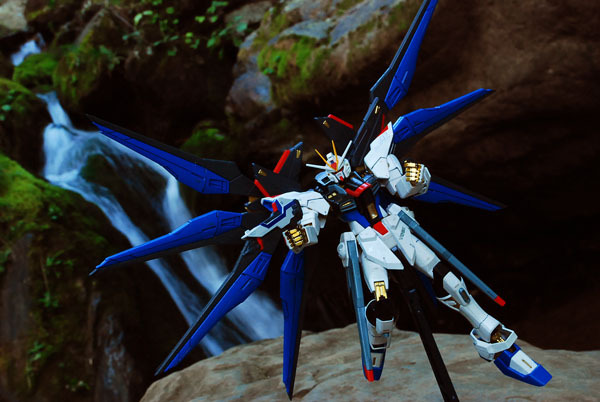 Really brings out the quality of your strike freedom. 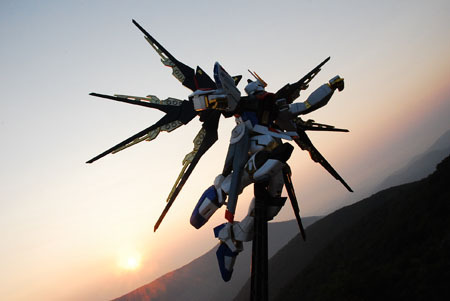 Looks like a nice relaxing photo shoot with your gundam. One of your pics remind me of one of my dad’s pictures of the sunrise where we live. Nice work! @Shinjiro Toida=Okawara’s a pretty good designer. My favorite is Hajime Katoki thanks to the Gundam Fix Figuration Figures. @NY Ranger=I like the EZ-8 and I’m going to get the HCM version when it comes out. The RX79 g needs a buddy. Good luck w/your pics. @Marvin Ryan=It’s not that bad since the MG’s are pretty light and not too big, that said the Aile Striker is the last PG I will take w/me on a mountain. ^_^: The hard part is getting steady footing around the model. 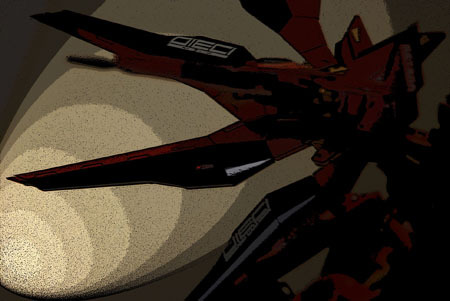 @Scout=1.The banner at the beginning of the video I lifted off of a still of one of the Gundam Seed episodes and used photoshop to lift it off the picture. 2. Windows Movie Maker & Photoshop CS3 3. It’s not an original but something I came up with. It depends on the series you like, but I think the MG Hi-v wouldn’t be a bad start. @Rsnumber2=Tamiya really worked well, in fact there were some parts that were glossy because of the paint that I didn’t need to top coat it. I was thinking about getting an airbrush before, but after seeing the results on Tamiya, it’s good enough for me. @Patrick Guiles=For plates, I only added Top Coat to the Gold Plates in the wings, but none of the other plates got coated. I probably could’ve gotten away without top coat on the wings because they have the same brilliance. @Toji=I wish they would! Before I got the Strike Freedom I played with the idea of getting the PG rouge and coloring it in the Freedom colors. 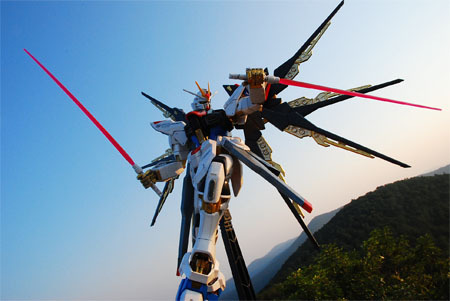 But a PG Strike Freedom would save me a lot of work! @Yuusuke=It’s fast becoming my favorite as well. They really need to make a PG out of this one. @Alafista=Thank you. After making it I knew I couldn’t do it justice with indoor pics. @Sakura-chan=It was a pretty nice photoshoot, first time shooting during sunrise and I enjoyed it. Hopefully they’ll be the same weather this week for my next Gundam. Hi fixt! I like your web! do you have messenger? please PLEAAASE add me. Nice paint job on the Strike Freedom the pictures are great! The wait on your Top Coat is something I’m familiar with. Some Top Coats can take days to a week to dry especially if it’s humid outside. Great job on the pictures and putting together the model. I need to find some time to put my Zaku’s together. Blue Ridge Park’s got a great view of the sunset, I’ve been there a few times. Hey! first off very nice pics and great looking model. this is my first time on your site and i was wondering if you could answer a question for me. on the mica blue painted parts the pen would not stay on but on the parts i painted matt white it was impossible to erase lines that went over. i did not use top coat and im wondering is that why? would top coat make the ink stick better but also make it removable? (on my previously unpainted models the panels lines were easily removed) sorry to write so much and dig up a post from so far. @Daydream=The Strike Freedom was the first time I spray painted and panel lined a Gundam kit and I can give you my experience with it and The Strike Enforcer. First of all I use “Gundam Markers” to line which I’ve heard works well after painting your kit as it did with my kits. Having said that I did find that it was a lot tougher(!) to erase panel lines from the matte white spray painted armor parts of the Strike Freedom. However it was possible for me to erase the errors by pressing on the eraser a bit harder than usual. I’m assuming you and I had an easier time with the blue parts because the blue is mica and brilliant blue ( both gloss) which the surface of the paint is a lot easier to rub off smudge marks and ink lines rather a non-gloss paint like matte white. Out of my experience with Top Coat(specifically “model masters”=which is not ideal, but luckily worked with the tamiya acrylic..this time! ), it not only helps to keep the paint on the kit but the panel lines as well. Trust me, I dropped the Strike Enforcer from a ledge from a mountain and it fell about a foot onto another ledge and barely a scratch! I don’t know if putting Top Coat first and then panel lining would improve the situation, but I would assume not. Also putting Top Coat on and then trying to erase pre-existing lines would not be possible in my mind since the top coat is the top line between the eraser and the ink. 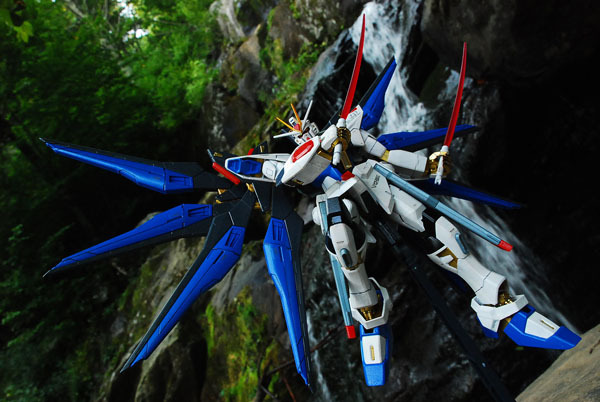 Hi, I love the gold on your strike freedom and was wondering, what tamiya gold (like leaf or regular gold) did you use for your SF? Was it PS, TS, or AS type of spray can? What type of top coat did you use, matt or gloss? @Jacky=Thank you. For the Strike Freedom I did not use any Tamiya paint on the Gold parts since this Strike Freedom is the Full Burst mode that carries the already gold coating parts. 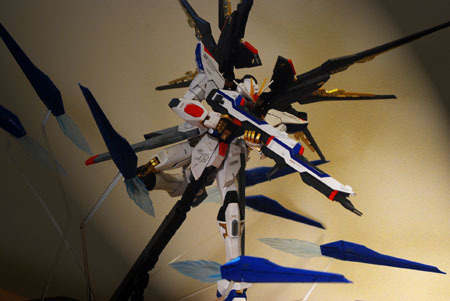 However, my modded Strike Freedom I did paint it using TAMIYA GOLD (REGULAR). You can look at the model’s gold to see my results. In my opinion the Strike Freedom’s Full Burst gold plating parts look much better. For Top Coat, I used model master’s enamel clear coat. But I was pretty lucky in that it didn’t ruin it. From people I’ve asked, acrylic spray paint and enamel top coat would create a reaction that could be bad. I’ve since experimented with different top coats and found that an acrylic matte top coat like(MR. TOP COAT) is the best way to go. can you tell me how big your gundam full burst is ? A little question: I’m buying my first kit(an MG freedom) and I want to paint it. Does the SF have the same colour scheme and do you have any tips on using spray paints?